If you are short of time, the answers to the following 3 questions should let you know all you need to about the Sonicare Essence. If we have missed something, let us know in the comments. If you want more detail, you can read our full Philips Sonicare Essence review further down the page or watch a video review. There is nothing drastically wrong with this toothbrush, but it is not the ‘best’ that money can buy. It does the job, but it is bulky and heavy. It might be a stretch, but if you can afford it, the ProtectiveClean 4100 is a much better buy and will pay off long term, when it comes to achieving fantastic oral health. But, if you are on a budget, you might want to check out our recommendation for the best cheap electric toothbrush, the Fairywill FW-917. A new name in electric toothbrushes, it is slimmer, lighter and more feature rich for a similar price to the Essence. 3. Where is the best place to buy the Sonicare Essence? Stocked in Walmart, Best Buy, Amazon, Kohls, Kmart and Philips own online store to name a few, you have choice when it comes to buying this brush. The recommended retail price is $24.99 but we have seen some outlets selling it for more than this, whilst others like Amazon (who tend to be very competitive on price) often sell it cheaper. Pay a price that you are happy with and buy from a retailer you are happy to buy from, but as best as possible avoid paying over the RRP. If you buy from Amazon you can be pretty much assured that you will be getting the best price possible. We’ve included a live price comparison of US retailers below, and it’s always worth checking out eBay too. This is an entry-level brush. It does not shout “look at me” with some cutting edge design. It is not laden with very smart new features such as Bluetooth connectivity, nor does it have the ability to remind you via an LED that it is time to change your brush head. For features like this, you need to look at premium models like the Sonicare DiamondClean Smart. The Essence is about function, doing the core job and in this case, cleaning the teeth well. It benefits from the basic features you would expect of an electric toothbrush and as such is one of the best selling brushes within the USA. There are at the time of writing 2 variants of this brush, the difference between them is nothing more than the colour of the brush handle. The features of the brush and their capabilities are the same. On the Pink coloured unit, the contoured grips are Pink rather than the Blue colour shown in the pictures throughout this review. There is too a Pink bubble/circle design on the brush handle. Price – There is no denying this is a cheap and good value option. Battery life – 2 weeks battery life is pretty good, especially when you compare it to Oral-B’s offerings at this price point. Features – Automatic power off and the easystart programme are premium features and normally would not expect them on a brush of this price. Size & weight – This is not the slimmest of brushes. In the box with the Sonicare Essence HX6511/01 you get all you need of an electric toothbrush. Whilst there are extra desireable features I would like to have (quadpacer and pressure sensor), I have to say you could do a lot worse and Sonicare have really thought out what is on offer with this brush. In fact they include a couple of really clever extra touches that you would not expect. There are 2 key parts to the brush, they are the handle and the detachable brush head. The design of the handle is fairly basic and functional, but it is also chunky and heavy. If this is your first electric toothbrush you might think that this is what they are all like, but to be honest, the vast majority are not as heavy or as thick as this is. Compared to a manual toothbrush there is a significant difference. Part of this heft to the handle has to do with the battery, but more on that shortly. Despite being bigger in the hand, it is easy to grip onto and there are a couple of contours in the body of the handle that allow the fingers and thumb to naturally grip to. Where a lot of brush handles are cylindrical or oval shaped, the Essence is a bit more angular. The basic shape is cylindrical but there are flatter edges to the handle that help with the grip. The images best show off what I mean by this. White in colour the smooth touch plastic handle does not have a lot going on. At the front there is the Philips Sonicare logo in a silver/grey colour and just below that a mint green rubber button. This is the power button that turns the brush on and off. A green LED is also built into the centre of this button. The rest of the handle including the rear is relatively smooth to the touch and free of any other controls. Normally on an electric toothbrush there is a recess on the bottom of the brush handle, into which a prong on the top of a charging stand fits, not in this instance, the base of the handle is flat and the whole brush sits upright. At the top of the brush handle is an opening to which the detachable brush head fits. The brush head screws on, a bit like you would screw a lid onto a bottle. The difference being that the brush head on the Essence has a metal/plastic setup that fits inside the brush handle. When fitted and screwed into place, the battery inside the brush handle powers the motor and in turn creates a strong vibration that it passed up through the brush head and to the bristles to create movement. The whole brush handle is sealed with all the tech inside the brush handle. The battery is not user replaceable. In fact believe it or not, the brush handle is actually dishwasher safe! So using it in the shower it no problem at all. Press the power button and that launches the one and only cleaning mode available on this brush. Delivering up to 31,000 strokes per minute this cleaning mode lasts for 2 minutes and can remove 2x more plaque than a manual brush. If you’re interested in more cleaning modes, we run through all of those that Sonicare offers in this post. Built into the handle is a timer, which means that as the brush is powered on, the timer kicks in. You should brush your teeth for 2 minutes, twice a day. The Essence times the clean and at the end of the 2 minute clean automatically turns the brush handle off to conserve battery power but also make you aware the clean is complete. Other models have a built in quadpacer or 30 second timer. For me, this is what the Essence is really missing. The automatic power off is fabulous, but more useful would be the 30 second pacer to ensure you and I focus equally on different parts of the mouth. If this is your first electric toothbrush you will notice the difference, it is very effective at cleaning the teeth. It will improve your oral health. But for many getting used to an electric toothbrush can take some time. Sonicare have built in a very clever feature. Called Easy-Start, what it does is for the first 12 brushing sessions is gradually increase the power of the brush. So, the first time you switch the brush on, it is not operating at full power. By a week in the 12 cleans will be complete and you will be at full power. This eases you, and your gums into the extra power the brush delivers. This is a small, but superb touch that really makes a difference. The clean provided by this brush is good. Having personally used lots of different brushes, I can’t say the clean offered by the Essence is bad in any way. Something just to be aware of is that brushing your teeth with a manual toothbrush is different to an electric brush, you need a different technique, so be sure to pay attention to the instructions provided with this brush that explain this. A common problem across the population is brushing too hard. Bristles of a toothbrush, be that electric or manual need only skim the surface of the teeth. Over time, excessive pressure when brushing can lead to gum recession. Some brushes, normally premium models have a pressure sensor built in, which alerts you when you are brushing too hard. The Essence does not have such a feature, which in my eyes is a shame. As brushes go, this brush is an older design and does not boast a lot of the modern tech you see in more expensive brushes, but it still has what you need and performs well. The brush head in particular is the best example of where the technology is a bit dated. Firstly there is not the range of brush heads for Essence as there is other models. The configuration means that you are limited to the few e-series brush heads that are available. For the most part this is fine, but if you want lots of choice, the Essence is not for you. You can get a compact version of the brush head supplied and also a sensitive variant. Because the Essence is the only Sonicare handle to use these heads, the prices of the official heads are also slightly higher than we would like. Cheaper third party options exist. The heads screw on and off of the handle where newer variants just clip on and off. This also has the effect that the brush is a lot noisier when switched on than most other Sonicare brushes. Normally just a humming sound, the Essence has a more mechanical sound. Any other electric toothbrush from Sonicare is better. Just bear in mind if you brush your teeth with others sleeping near by. Something that this brush head does offer, which is less common is the angle to the neck of the brush and head. You will see in the hands on images that the brush head tilts in. This can really help with reaching back teeth and following the gumline. Newer brushes don’t offer this. Part of the reason the brush is thick and weighty is because of the battery that is built in. It is a Nickel Metal Hydride battery. Explained more in the battery section of this review, it is an older technology and subsequently the battery size is larger and heavier than slightly more modern equivalents. But, to be fair it offers decent performance with 2 weeks battery life, which at this price point is impressive for a rechargeable brush. There is no battery status bar/icon as such, although the LED on the brush handle does flash post use if the battery is low. You also get 5 bleeps from the brush handle too. These bleeps kick in when there is about enough brushing time for 3 more cleans left in the battery. This is yet another small example of where the Sonicare wins for simple well thought out features. A charging stand is provided. It can take 24 hours to charge the brush handle fully. Despite being a bit chunky and heavy the Essence performs really well and punches above its price point for the battery life and little extra features it offers. All of this is backed by a 2 year Philips warranty, which can be extended by 6 months if the brush is registered online. The battery is a Nickel Metal Hydride (NiMH) battery, which is unusual for Sonicare as their brushes are usually Lithium-Ion (li-ion). However, this is an older brush and it is not surprising that a slightly older technology used here. As such the battery is physically larger and heavier, hence the size and weight. The primary difference is that lithium batteries do not degrade as quickly. Provided in the box is a charging stand that the brush sits on, it connects to the mains socket and works on 110-120v. The charging stand is white in colour and has a lip within which the handle sits for charging. It uses wireless charging, there is no physical connection between the brush and the charging stand. The stand itself will likely resist a splash of water, but it should not get wet like the brush can. Up to 24 hours it takes to charge the brush, but once charged, 2 weeks usage time is possible. Based on 1 user cleaning their teeth for 2 minutes twice a day, that is 56 minutes of usage time from the brush. When there are 3 or less brushing sessions left from the battery, at the end of the clean the brush will emit 5 beep sounds and the LED in the power button will flash. When on charge that LED will flash continuously. It does not go out when fully charged. $24.99 is the recommended retail price of this toothbrush according to Philips own website and for the most part, retailers sell it at this price too — we’ve included a live price comparison here. A few are actually selling ts for more, as much as $10 more. But, without too much shopping around and in particular the very competitive pricing that is available from online retailers, you will find some better deals on the brush. Typically the price is not much lower than the recommended price, but it is possible to purchase it for as low as $20. This makes it one of the cheapest electric toothbrushes with a built in battery. As a result it is one of the best selling brushes within the USA. Brush heads should be replaced every 3 months and as a rough guide (prices vary) they are around $10 each. It seems slightly crazy that 1 replacement brush head is essentially half the price of the brush handle itself. The Sonicare Essence costs $135 to buy the brush and brush heads (1 x brush handle at $25 + 11 brush heads at $10 each) or just $0.12 cents per day to own. Far from the most expensive brush to own, the relatively high cost of each brush heads does mean that the overall cost is higher than you might like or think. With other brands, brush heads often are a little cheaper, when you price it over 3 years. You might find that a more premium brush can be had for a similar price, because the ongoing cost of the heads is less. My recommended alternative brushes, the Oral-B Pro 1000 and Sonicare 2 Series are both more expensive to buy initially, but the heads are a little bit more cost effective. At the end of the day, it is your decision on what you pay. Pay a price you are comfortable with. As I have acknowledged earlier in the review, the Essence is not the latest model from Sonicare, but although it might not employ the very latest in toothbrush tech and standards it is a well built unit. A positive or a negative is that the weight of the battery inside keeps this sat nicely upright on a countertop, but it might make a bit of a bang if dropped! Believe it or not the brush handle is actually dishwasher safe, so that gives you an idea of how well built this brush is. When testing any brush here at Electric Teeth, we look for possible signs of weakness by assessing the brush by eye, using it and comparing to other models. A slightly older battery technology is used within the handle so this could be a potential longer term weakness as could the slightly more flimsy screw on head mechanism, but neither are real cause for concerns. The brush comes with a 2 year warranty and for the sake of just a couple of minutes registering it online, you get an extra 6 months free. It is one of the chunkier and most weighty electric toothbrushes I have used. Initially it is easy to be put off by this, but when you actually consider what you get for the price, it’s pretty good. It has the basics of a good electric toothbrush covered and is not a bad buy, but you can certainly do better. Is the Sonicare Essence an oscillating brush? What cleaning modes does the Essence have? 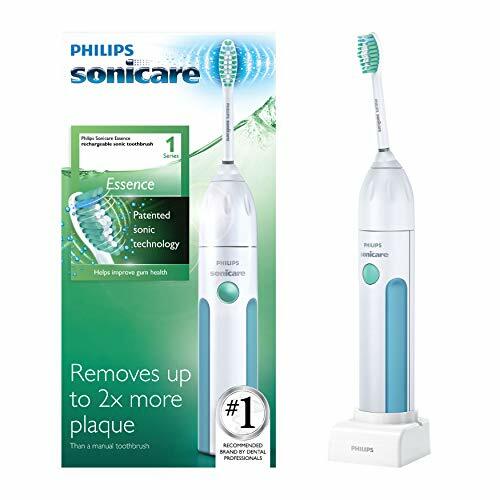 The Essence comes with Sonicare’s E-series brush head. 1 is supplied in the box, the standard sized head. Compact versions and a Sensitive brush head also exists. There is not the choice that you get with newer models. Does the Essence have a pressure sensor? Does the Essence have Bluetooth? Does the Sonicare Essence come with a warranty & how long is it? If purchased new from an approved retailer the Essence will come with a 2 year warranty which can be extended by a further 6 months in total if you register the brush online at Sonicares website. Does the Essence have a built in timer? Yes. A 2 minute timer is built in, but there is no quadpacer or 30 second timer as there are in many other brushes. Once powered on the brush runs for 2 minutes and will automatically power off at the end of the 2 minutes. The Essence charging station has not been designed to be fixed to a wall. Can I use the Essence in the shower? Yes. The Essence is water resistant so if you choose you can use it in the shower.